← Hard evidence: How biased is the BBC? So here we are again; it seems that a week cannot pass without one or more of the right wing journals or opinion sheets accusing the BBC of “liberal” or “left-wing” bias. 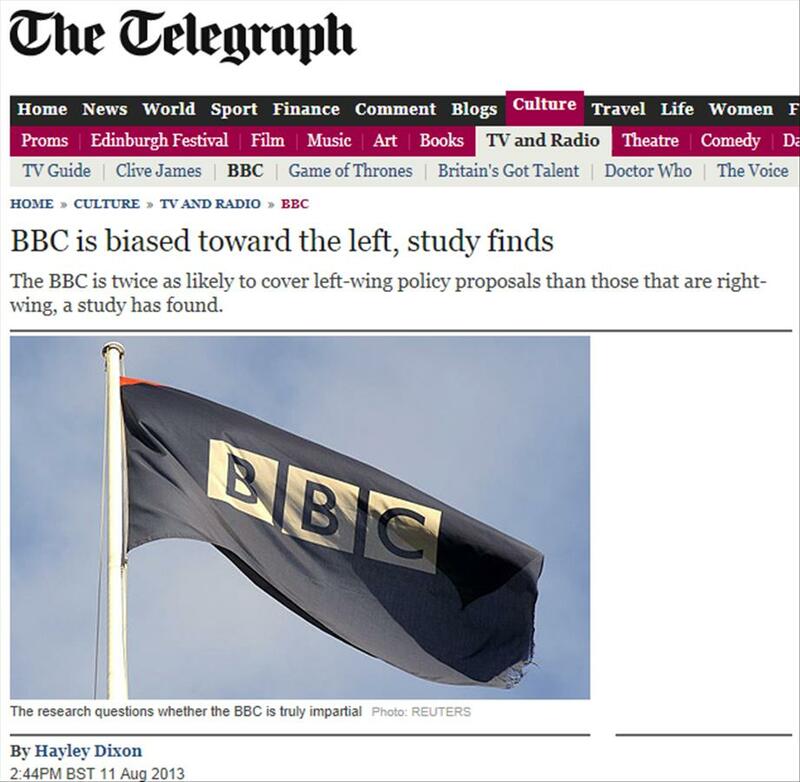 This week it is The Telegraph, in the form of Hayley Dixon, that has decided to throw its weight behind a (very) right wing think tank piece accusing the BBC of being biased in favour of “left-of-centre” views. The ‘research‘, such as it is, was performed for the Centre for Policy Studies – an organisation founded by those renowned supporters of the BBC Margaret Thatcher and Keith Joseph in 1974. Ordinarily I would be tempted to stop at this point and allow any readers to make up their own minds as to how objective anything sponsored by the CPS is likely to be but I thought that it might be fun to briefly examine the Telegraph’s take on this quasi-academic pseudo-scientific detritus. According to the Telegraph, the CPS has “found statistical evidence that challenges the [BBCs] claim to fairness”. “The BBC are more likely to cover left-wing think tank reports and to hail them as “independent” while giving right-wing research a “health warning” by pointing out its ideological position, the Centre for Policy Studies have found. Oh really? That sounds incredible and seems to confirm what the Telegraph, Rupert Murdoch and the Daily Mail have claimed for years. I am understandably concerned… even appalled. How exactly was this statistical research performed? Presumably an extensive examination of thousands of hours of BBC broadcast output and tens of thousands of pages of its online reporting was examined for bias? The research was performed by comparing coverage given to think tanks on the BBC website with that given by the Guardian and the Telegraph. So apparently the Telegraph and the CPS believe that the measure of whether the BBC is biased to the left or the right may be ascertained by measuring how often it mentions a left wing or a right wing think tank and whether it assigns a “health warning” to that think tank. You are just not that important. How much naval gazing must one do before coming to the conclusion that the only important output of an institution with the size and breadth of BBC News is that which mentions think tanks? Sheesh! But they don’t stop there. “The implication seems to be that the BBC sees left-of-centre views as being more reliable than right-of-centre ones. Overall, the picture is that the existing accusations of bias at the BBC are supported by a more dispassionate, quantitative analysis,” Mr Latham said. Note how there is a consistent emphasis on “statistical evidence” and “quantitative analysis” which seems to give this unscientific not peer-reviewed self-abuse the semblance of ‘scientific’ credibility. Mr Latham called on the corporation to be more open to criticism and to respond to it, adding that it was in their “best interest” both because of its commitment to impartiality and because if a media organisation “loses its reputation for balanced reporting is also likely to lose its ability to influence and persuade the public”. Previous research has also found evidence of a bias, for example on the Today programme roughly twice as much coverage was given to pro-EU voices as anti-EU. But the research was all based upon specific case studies rather than a broad approach, the team claim. Who do the Telegraph and Mr Knox think they are fooling? It is NOT ‘statistical evidence’ of liberal bias at the BBC. It is not really statistically meaningful evidence of anything! If you want to read the ONLY meaningful research carried out on BBC news’ output that tests its impartiality or otherwise on a basis that is both quantitatively AND qualitatively meaningful (and Tim Knox might want to look up the meaning and importance of ‘confidence levels’ in statistical analysis) then here is a summary of the findings of the research carried out by Mike Berry et al of Cardiff University and recently published in The Conversation. I don’t think that I am ruining the surprise by telling you that the research demonstrates that, where bias exists in the BBCs news output, it is in favour of the Conservative Party and a right of centre, Eurosceptic pro business agenda. Now that is a story I would like to read more about in the Telegraph but I doubt that they want to dwell on it. Of course, given BBC News’ right-wing bias has been established by the Cardiff University study, the appointment of the former editor of The Times and some time Rupert Murdoch acolyte, James Harding, to the position of Director of News means a move to address any partiality in favour of the Conservative party is unlikely in the near future. Harding has the credentials of the most establishment of establishment figures. Educated at St Paul’s (like George Osborne) and Trinity College Cambridge with a prolonged period at The Financial Times before joining The Times as business editor in 2006 and becoming editor one year later. He joins a number of Tory supporters that are prominent in the BBC News higher echelons including former Sunday Times editor Andrew Neil and former president of the young Conservatives and now BBC political editor Nick Robinson. Harding’s departure from The Times was considered by many to be a surprise and it seems likely that he was sacked. He has been a loud critic of the BBC’s news output but not for its right-wing bias so there is every possibility that a move further to the right could well be on the cards and that, in my humble opinion, would have disastrous consequences for the reputation of the BBC at home and overseas. Meanwhile expect The Telegraph, The Daily Mail and The Sun to continue bemoaning the BBC’s ‘left-wing bias’ irrespective of the facts. #Sigh.